Armed with their new “Mark-to-Mickey Mouse” accounting sub-standards, JP Morgan felt free to report their fiscal first quarter 2009 earnings in the traditional manner of the credit bubble. They frontloaded profits with one time gains, papered over losses, and beat phony prearranged expectations. On paper at least, the ruse worked. With the loosened standards, Morgan posted a surprising first quarter profit. But what JP Morgan tried to sweep under the FASA carpet, a newly scorched investor deftly exposed. US banking giant JPMorgan Chase announced a net profit of $US2.1 billion ($A2.89 billion) for the first quarter of 2009, beating expectations just as peer Goldman Sachs did earlier this week. “The firm earned more than two billion dollars this quarter, despite extremely high credit costs,” chief executive Jamie Dimon said in a statement. Dimon noted that JPMorgan had suffered extremely high credit costs, especially in its card-services and retail financial services divisions. “It is reasonable to expect additional increases to credit reserves if the economic environment worsens,” but the company was confident that it would be able to ride out a worsening economy. In the group’s investment banking business, revenue more than doubled and it made a $US1.61 billion ($A2.21 billion) profit owing to record results on trading operations. JPMorgan became the biggest US deposit holder following its acquisition of Washington Mutual for $US1.9 billion ($A2.61 billion) amid the financial crisis last September. Indeed, it is reasonable to expect additional increases to credit reserves, because the economy will worsen, but it is unreasonable to expect the trading gains to continue in that worsened environment. JPMorgan Chase (JPM.N) and Goldman Sachs Group (GS.N) racked up billions of dollars in trading profits in a volatile first quarter — but don’t expect these lucrative markets to last into the next quarter, or to necessarily benefit other banks, analysts say. They both expanded market share following Lehman Brothers’ demise in September and Bank of America Corp’s (BAC.N) capture of Merrill Lynch & Co.
Everyone knows this is the business line that outperformed this quarter,” said Wong, adding that as other firms jump onto the bandwagon, there will be more competition for trades and underwriting fees. While the bank has largely avoided the losses and writedowns on complex debt securities and subprime mortgages that hurt other banks in 2008, it is heavily exposed to consumer credit and chief executive Jamie Dimon has warned that rising unemployment will hurt the bank’s consumer businesses in 2009. Avoided the losses and writedowns on complex debt securities and subprime mortgages? Or simply didn’t have to take them? What a coincidence! As as soon as they beat SFAS 159, the write-downs disappear, leaving the major action of the quarter in the markdown market. Legacy assets means long held assets that simply can’t be given it away. This is the junk that used to be called level three. $711 million + $214 million is the difference between where JP Morgan valued its stuff, and the market’s opinion of the same. If JP Morgan had to write down those very same assets, it would have come directly off the top line (revenue) and slammed to the bottom with a billion dollar thud. And that’s not counting the charge-offs on HELOCs that totaled $248 million. What a difference! If you can stand to, look now at the Alt-A exposure of $5.5 billion, which they say is difficult to hedge effectively. The real difficulty with the Alt-A is the most likely, namely default. If Jamie’s “economic environment worsens,” Alt-A will show its true intrinsic value: zero. All $6.5 billion of the JP Morgan mark downs are living in what I like to call “write-down purgatory.” That’s just the surface of what was up for grabs. How much more funky junk does it still hold at fantasized valuations? No one knows, on the company press release, it lists mortgages. JP Morgan may as well ask you to suspend your belief in gravity. On earth the $19.1 billion would easily be the low ball estimate of this quarter’s addition to what was – until just a few weeks ago – level-3 assets. Finally in the “we win for losing” category, JP Morgan says $679 million fell under victim under SFAS 157. Fixed Income Markets revenue was a record $4.9 billion, compared with $466 million in the prior year. The increase was driven by record results in credit trading, emerging markets and rates, combined with strong results in currencies and gains of $422 million from the widening of the firm’s credit spread on certain structured liabilities. as well as gains of $216 million from the widening of the firm’s credit spread on certain structured liabilities. So, part of JP Morgan’s dazzling profit increase came from a decrease in the price of its own bonds. The company reports a gain because they could retire the bonds and buy them back at a cheaper price. Think that works? Try it with your home that’s under-water. It’s blatant hocus pocus, but that’s financial accounting standards. 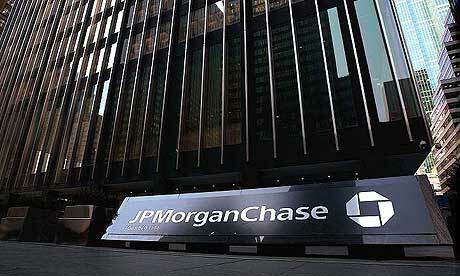 JP Morgan’s actions tell the truth. Part of that truth comes courtesy of the credit loss provisions in the investment banking division which doubled from $618 million a year ago, and $6 billion big ones the bank stealthily raised on, so fittingly, April fools day. You seriously can’t make this stuff up. Guarantee Program, said IFR, a Thomson Reuters service. * GUARANTEED BY FEDERAL DEPOSIT INSURANCE CORPORATION. JP Morgan sells em, the FDIC guaranteed em, and that makes em a bail-out in drag. Cute! And the $6 billion more than covers the $17 million the bank wont get from the Alabama Public Schools JP Morgan has been trying to screw since 2002. An Alabama agency that finances school construction won’t make payments due to JPMorgan Chase & Co. under a derivative trade until a U.S. court rules on the state’s lawsuit seeking to have the contract thrown out. The Alabama Public School and College Authority filed a lawsuit in federal court in October seeking to void the so- called swaption, or option on an interest-rate swap, that it sold to JPMorgan in 2002. The authority was set to make a $17.7 million payment on May 1, its first under the disputed contract. “It would not be proper for me to authorize the use of taxpayer money for any payment due under the agreements until the court resolves those issues and determines our rights and obligations,” Alabama Finance Director James Main said in a statement e-mailed to reporters late yesterday. Where does Alabama Finance Director James Main get off? The improper authorization of taxpayer money has never prevented a payout to a culprit yet. It’s unamerician to think that a major bank like Morgan would be kept waiting for its ripped-off receipts, let alone not collect them, but someone seems to be giving it a shot even if Uncle Sam is not. You have to worry that Diamond and other Morgan big shots will be relegated to flying used private jets. That would be heartbreaking. Embattled bank JPMorgan Chase, the recipient of $25 billion in TARP funds, is going ahead with a $138 million plan to buy two new luxury corporate jets and build “the premier corporate aircraft hangar on the eastern seaboard” to house them, ABC News has learned. The financial giant’s upgrade includes nearly $120 million for two Gulfstream 650 planes and $18 million for a lavish renovation of a hangar at the Westchester Airport outside New York City. Now now don’t be that way! You’ll hurt thier feelings. From Morgan’s point of view, it was never your money, but theirs all along, and now that they don’t want it in your dirty hands anymore, theyjust want to take it back. So, they build luxury hangers and buy new jets and charge you the bill, just as if you were any other client. Net revenue was a record $8.3 billion, an increase of $5.3 billion from the prior year. Investment banking fees were $1.4 billion, up 14% from the prior year. Advisory fees were $479 million, flat compared with the prior year. Debt underwriting fees were $593 million, up 63% from the prior year, driven by improved bond market conditions, as well as higher loan syndication fees compared with a weak prior year. Equity underwriting fees were $308 million, down 14% from the prior year, due to continued challenging market conditions. Fixed Income Markets revenue was a record $4.9 billion, compared with $466 million in the prior year. That says it all. All the earnings come from unsustainable trading profits and fees from here to nowhere. It’s the same old fee-based model the company always had. The fee-based model is as dead as the credit markets, so why is JP Morgan still alive? Well you can believe that it’s all thanks to you, with no thanks to you from JP Morgan.